Liberal Bohemian: Evil for evil must go. In the distant past, a rite called the Devil's Dance was performed annually on this date (approximately) as part of the Tibetan New Year festival. 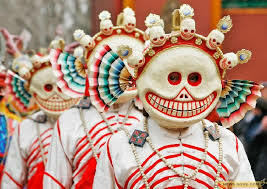 Monks wearing grotesque masks would dance for hours as a village sorcerer exorcised demons and the evil influences of the past year with various magical incantations. -Everyone understands that evil cannot destroy evil. We only increase it when we believe people must be punished for doing something wrong. We don't get rid of evil but multiply it when we return evil for evil.